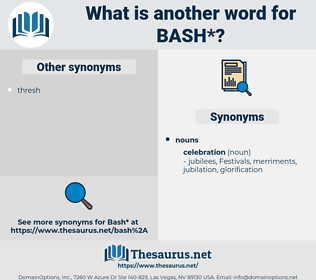 What is another word for bash? a forceful blow, especially one that does damage to its target. 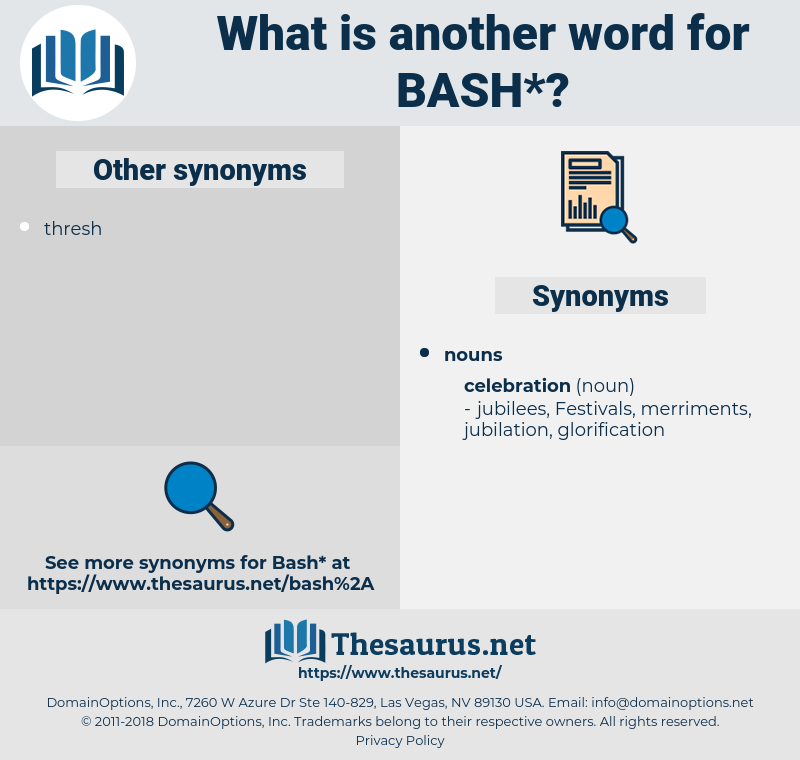 Bay Of Biscay, boogie-woogie, Bokkos, buckeye, bazooka, biz, baisa, bassia, BJA, basso, beefcake, baggage, bbs, booze, boxy, beach, bushwhack, big cheese, busy, bake, beachy, bocce, biface, bakehouse, biskek, bisque, bioassay, buggy, bush, bakshis, beach house, babassu, baby buggy, besiege, bobbysocks, boozy, boss, biggish, bise, bigwig, bowse, buckshee, basuco, bask, bias, basque, bogey, beige, buzz saw, basics, bhaga, baku, be sick, back away, bioko, baccy, boogie, Bok Choy, bushy, baby shoe, big, boche, bagascosis, BCE, bezique, bose, bagasse, bogus, bacchic, Bayes, bossy, boccaccio, bypass, Bok Choi, buxaceae, beg, buyback, babyish, BASCH, beech, bps, bse, basis, bissau, babka, boccie, bigos, bouchee, bs, by choice, baisakh, beck, bibos, backache, booboisie, byssus, bus, bock, BC, bouse, bio-assay, beak, bass, bee house, baic, buss, big H, bize, box, bos, buy back, back, bacca, baksheesh, buck, backhoe, bach, back saw, biopsy, baby-wise, buzz, bosc, bagassosis, bug, basic, bogie, bigeye, b.c.e., bosky, boggy, bisayas, bijou, bosie, bookcase, bogy, bucksaw, boyish, baize, bivouac, beeswax, b.c., book, bosch, bookie, befog, biophysics, baas, besseya, bk, bough, backsaw, bacchus, basia, bishkek, bakshish, bike, beseech, bosh, bog, bauhaus, bag, baiza, boise, backsheesh, bozo, babushka, BJS, bobbysock, backwash, baggy, Bosk, bahasa, base, bookish, bocci, buxus.